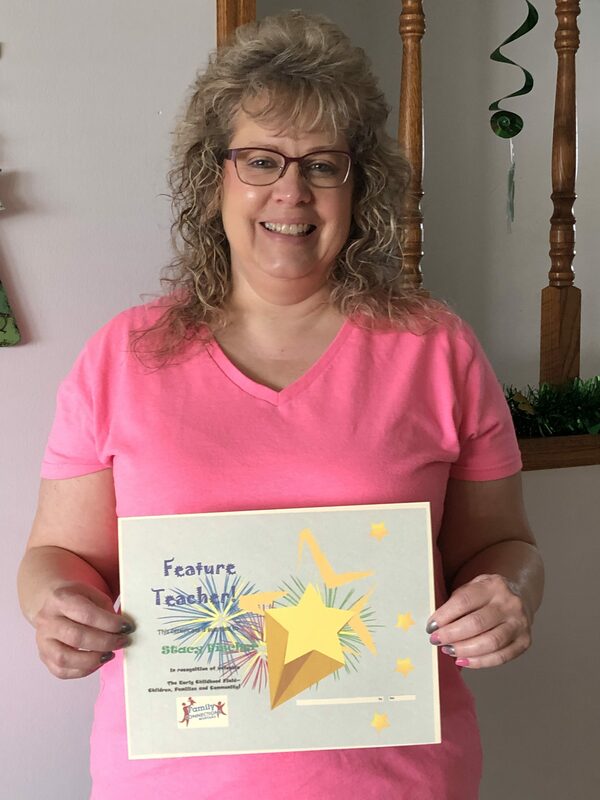 CONGRATULATIONS TO OUR MARCH FEATURE TEACHER WINNER STACY FISCHER! Stacy works at Kidz Korner Child Care for children 2-5 years old. She was working as an Early Childhood Professional for 20 years. Working with children has taught her to embrace every moment spent with them. The most important thing in her classroom is to ensure there is space for everyone to work together. Every child is a piece of a puzzle. They all have their individual wants and needs. Her two cents: The early childhood field can be a very rewarding job most days, but very trying also! Her Proudest Accomplishment: Watching the children grow up, move on, and see over the years what they have accomplished and to know I was a part of it. In the future, she wants to continue to help children in her care thrive and grow.